This post is part of a series on how to make your own affordable art. See my abstract art DIY right here and my potato prints DIY right over here. While we are in our semi temporary digs here we needed to get art on our walls. I brought home a cheap frame and mat from the art store and then made a little piece of art to fit the frame. I love the book The Little Prince. In fact I gave Paul a copy while we were dating that we still have. 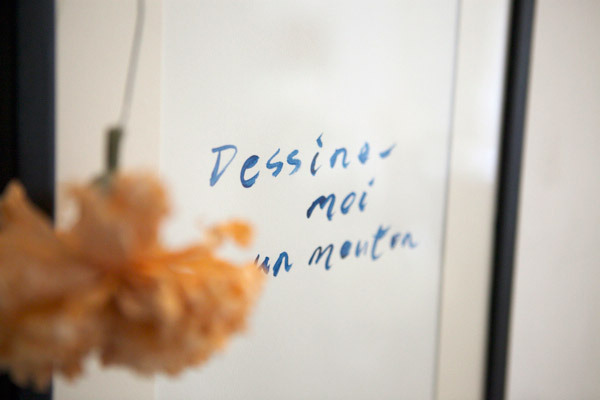 The phrase “Dessine-moi un mouton” comes from that book. 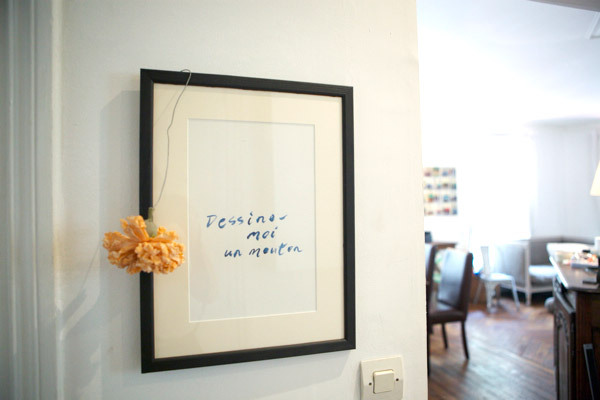 It means “Draw me a sheep” and if you are familiar with the book its alluding to the idea of staying childlike and “seeing with the heart.” We had it on our wall in San Francisco so we decided to make one for our Paris apartment too. Obviously you could use whatever phrase you wanted or that had meaning to you. This DIY is so easy I’m almost embarrassed to call it a DIY. Really, it took 5 minutes from start to finish. Step One: Think about the design. Figure out how big you want you art to be (consider the size of the mat board opening.) When thinking about the design make sure it has enough “white space” so it doesn’t look to crowded. Step Two: Get some paint and put a little on a palette (a plastic plate works great for this.) Then using your paint brush mix in water so it’s viscosity is closer to liquid than paste. Step Three: On the scrap paper practice painting the phrase until you find something you like. I find my handwriting is too “cutesy” for this kind of stuff so I usually have Paul write it. Step Four: Paint the phrase on the nice piece of paper. Let it dry (or use a hairdryer if you are impatient like me) and then pop it in your frame. Et Voila! 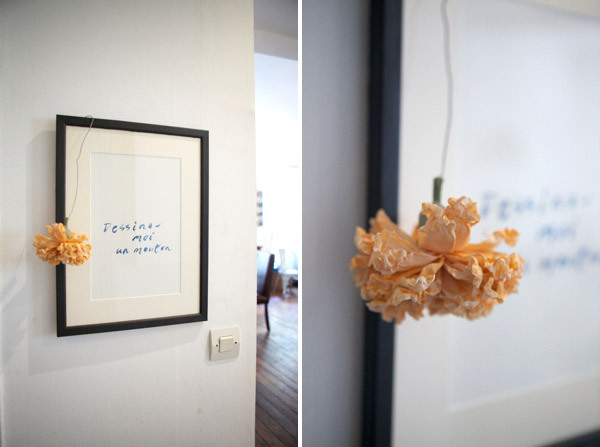 ps: My friends Aubrey and Charlotte gave me the pretty paper flower hanging on it. She found at the flea market. It’s so pretty, I love it. I love it! It’s always fun to have a phrase that mean something to you and your family. Thank you! I am always looking for cheaper art ideas and I do like paint. I’m terrible at it so these simple solutions are perfect for me. Now I just need to think of the words. Far beyond just great DIY projects, your blog has shown how to see truth, charm, humor, etc. in even the simplest of objects, moments, and experiences! I adore The Little Prince. Lovely idea! I’ve been looking for a way to add some artistic edge to a display of wedding photos. Doing one of these with a phrase from our ceremony would be a great way to make it less photo-centric. Love it! I remember reading The Little Prince in school, such a brilliant book- I must dig out my copy. You are my inpsiration for all things DIY! This is just lovely! i’ve been hoping to do something like this but on a large-chunk-of-plywood-type-scale. we moved to a new town and have to rent for awhile and the view out every window is a grey, sad concrete wall. i was thinking of getting some plywood and some colorful paints and maybe adding some of our favorite words or quotes to paint on the wood and lean them against the wall so we’d see happiness when we look out. 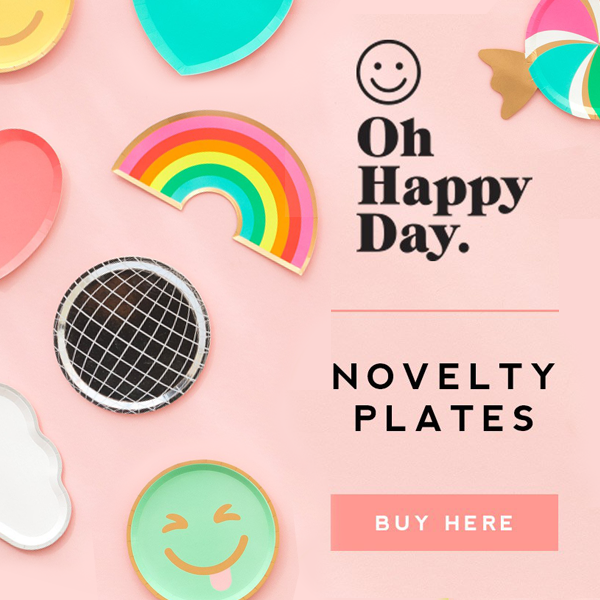 i am happy to see your diy today because it makes me think my imagined project won’t be so hard! ]I have the frame righ in fromt of me.. I’ve gottn tired of the image it holds already… and I think this is the perfect moment to live it up… but same as Katie, now I only have to think of the words.. I want something positive and nice but don’t want it to sound like “self improvement literature” HELP!! The Little Prince is my favorite book! Thanks for posting this project–I love that it’s also styled with his rose. I love this…such a classic book, and what a sweet saying. your navigation’s not working at the moment – sorry to be the bearer of bad news!! I absolutely love this! I didn’t realize you had painted the one from your SF place. This is such a good idea! I love that you quoted Le Petit Prince! don’t be embarrassed by the ease of it! sometimes we need a little reminder that we are capable of making cheap and simple things beautiful! thanks for the reminder. my man and i are moving soon and i need this kind of inspiration. love, love this! thanks for such a simple, great idea! After I read this post yesterday, I saw a similar piece in the window of a fancy home design store — but with a large stenciled word split up onto two lines (I’ve forgotten what the word was!) on the bottom half of canvas— a variation on this theme for those with less than excellent handwriting. I can’t believe I’ve only just found your blog – I love it and will be back often! This is a great idea and I would love to have a go. I’m on the look out for a nice quote to use. Sometimes the simplest ideas really can be the best! What a simple (and very French) idea! My stepmom used to so this when I was little! I JUST remembered! I can’t wait to do this! this is such a perfect diy! thanks for sharing. le petit prince is one of my favourite books and holds very special meaning for my husband and i. i also gave a copy to him to read when we were dating. it was a happy coincidence that our first home together would be unit 612 now we’ve got a growing collection of the story in many different languages; gifts from traveling friends. thanks again for the idea! LOVE…I actually do this a lot! With different languages, often phrases from poetry or songs & sometimes with calligraphy as well. What a fabulous idea!! Thank you so much for the inspiration!! YAY because I’ll have a new piece of art! Love how simple but chic this piece of art is…words can be so powerful! Would love to try this out using part of my favorite quote from Mark Twain,”…So throw off the bowlines, sail away from the safe harbor.” Although my handwriting may not be as lovely to look at, I’ll need some help! Decorar con tu frase preferida | openDeco. Decoración e interiorismo.